Largely under the radar screen, lawmakers are toying with ideas that could add as much as $1.5 trillion to the national debt in the coming decade. Washington is transfixed on President Obama’s new immigration reform executive action and the ultimate fate of the Keystone XL pipeline. But lurking in the background are proposals by lawmakers in the House and Senate that would use deficit financing to extend a slew of costly expiring tax provisions and compensate for overspending by Medicare. More than 50 tax provisions are typically renewed by Congress every two years or so without offsetting spending cuts or revenue hikes. These so-called “tax extenders” gradually add to the debt – but don’t get much attention. Some lawmakers, however, are considering breaking with tradition by expanding and permanently extending several of the biggest tax breaks. These include the highly popular Research & Experimentation Tax Credit – commonly known as the R&D Tax Credit – which allows companies to write off some of their spending on research, and refundable tax credits like the Child Tax Credit and the American Opportunity Tax Credit. On top of that, the deal would temporarily extend dozens of other tax provisions at their current levels for another two years. The maximum overall cost of that approach: nearly $1.2 trillion over ten years, including related interest costs. As the Committee for a Responsible Federal Budget (CRFB) points out, that would be five times more expensive than extending all the provisions for two years. Another enormously expensive idea under discussion is to permanently replace the Medicare Sustainable Growth Rate (SGR) formula – designed to control the rate of growth of the health care program for seniors. The SGR was created to make sure that yearly increases in expenses per Medicare beneficiaries do not exceed the growth of the overall economy. Whenever expenditures do exceed that level, Congress must reduce funding to reimburse physicians by a corresponding amount the following year. Congress in the past has come up with the money to spare doctors those cuts – the so-called “Doc Fix” – to prevent many from abandoning Medicare treatment. But if lawmakers decide this time to simply add the cost to the nation’s credit card, it would add $144 billion to the debt. 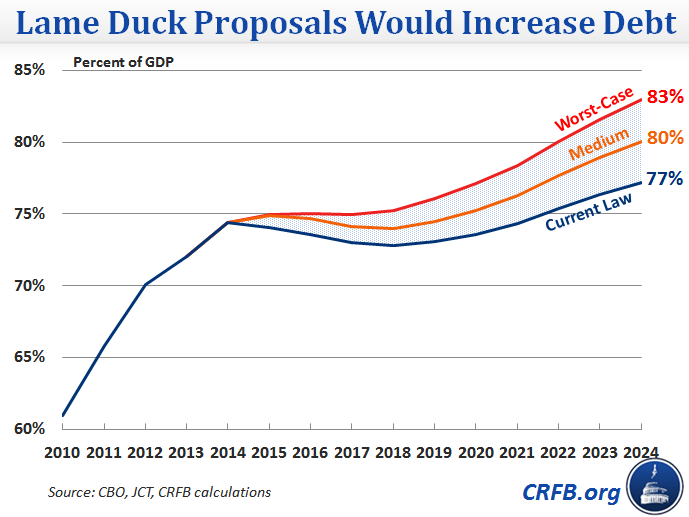 If these and other policies now on the table are approved during the lame duck session, ten-year deficits would increase by nearly $1.3 trillion – or $1.5 trillion after interest on borrowing is factored in. Last week Politico reported that high-ranking Democrats and Republicans in both chambers are exchanging ideas along these lines, although nothing is yet set in stone. Sen. Richard Durbin of Illinois, the deputy Democratic leader, told Politico there could be some horse trading going on, but wouldn’t say more. Sen. Chuck Grassley (R-IA), a senior member of the Finance Committee, agreed that permanently extending some provisions benefitting individual taxpayers is under discussion.